«Фотоаппарат ЗЕНИТ». IT MAY AS WELL BE. KMZ, the maker of Zorki may have made the cutest SLR ever. The „ZENIT“ (the camera pictured in this page is actually a „Zenit-S“ the synchronized version of the original Zenit, but shares the same physical specs) was KMZ’s original SLR. The factory ‘fused’ a rangefinder Zorki body with a mirror reflex housing and came up with this very smart camera. They were ahead of Leitz, whose SLR was yet to appear about a decade later. What KMZ made was a machine whose elegance, simplicity, and practicality were unmatched by any other SLR camera. It had no Western equivalent. It was born out of a sound design based on practicality and function. 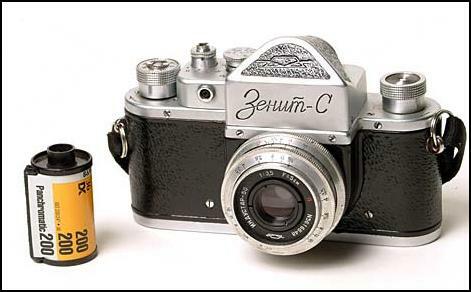 The Zenit could be considered as an SLR Zorki. It shares the same (LTM 39) lens mount, but lenses could not interchange. The body specs, save for the modifications made for the mirror and reflex mechanisms, were the same. Baseplates and spools are compatible between the two cameras. 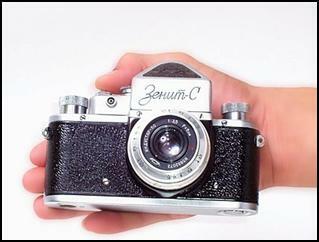 Like the Zorki, the Zenit is small and compact, being hardly larger than the former. It’s only slightly taller and deeper to accommodate the reflex finder. Drawbacks? Maybe, but not enough to discourage a Zenit User. This Zenit is a bottom loader like the Leica and Zorki. It uses the same M39x1 lens mount. 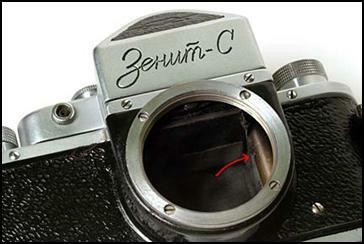 The Zenit-S has a twined cord to pull the mirror down (see arrow, right picture). This cord can wear and break, and repair can be difficult. The Zenit took film from the bottom, like the Zorki. It loads in the same way, and requires a long tongue film leader. 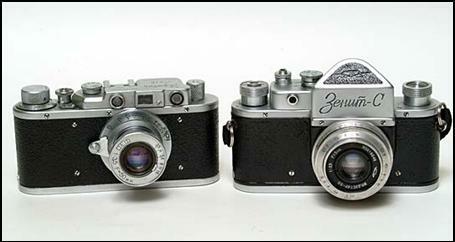 The Zorki and the Zenit even shared the same shutter derived from the Leica II cloth focal plane shutter. The shutter speeds were the same as in the Zorki- 1/30 (or 1/25) to 1/500, no slow speeds. It is interesting to note that most of the modern Zenit SLRs still use a similar cloth shutter, inherited from the Leica II, and with the same shutter speed range. The design has been proven so effective that it remains viable to this day. The Zenit, like the Zorki, can be still be used today. It is a real thinking camera- devoid of any automatic trappings. 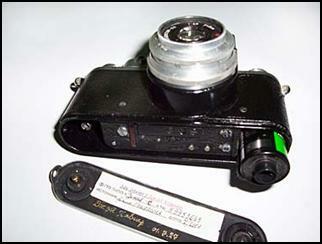 In fact, there are no such things as ‘automatic’ diaphragm or „instant return mirror” in the Zenit. The lens diaphragm is closed or opened like the Zorki RF lenses- doing so causes the viewfinder screen to dim or brighten according to the setting used. The mirror flips up, like in any other SLR, during exposure, causing the viewfinder to blackout. And the viewfinder remains black, until the shutter is wound…no post-exposure viewing is possible. These features can take us back to the early days of SLR photography. We get to realise the things which we now take for granted with modern cameras. A slow knob wind, slow focusing due to the dim finder, and going „totally blind” at the moment of exposure can really MAKE US THINK BEFORE WE SHOOT. Either the picture is made or missed. Such skills appear to have become scarce with the arrival fully automated cameras. The lenses for the Zenit have LTM 39 mount. The newer Zenit use the standard M42 screw mount (invented by Contax and exploited by Pentax). Lenses for Zorki or FED will mount but not focus properly on the Zenit. This is because of the longer working distance required for SLR lenses (also known as ‘back focus’). Zorki and FED lenses have a working distance of 28,8mm; Zenit used 45,2 mm. As such, a rangefinder lens mounted on a Zenit will make an excellent close-up lens. Most of the lenses supplied for the Zenit are the same as the ones for the Zorki, the familiar Industars and Jupiters have some Zenit M39 versions. Some of these lenses do have a „pre-set“ diaphragm ring which makes aperture setting more efficient. The SLR camera which Leitz did not make. Leica IIIc (wartime) and a 1956 Zenit-S.